They are perfect for my afternoon tea, Jean. Thanks, Angie. They disappeared fast, so none today! Chocolate…the root of all evil. Sugar…puh! NOT! Sooooo, you’ve gotten down to the nitty-gritty. Excellent, excellent. But freeze? Freeze what? 48 brown bites? 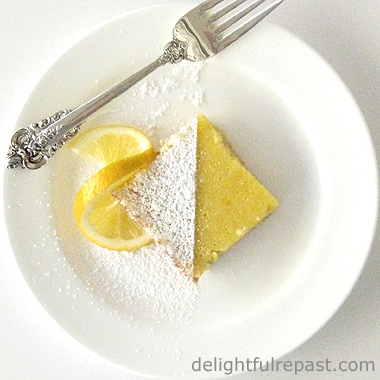 Methinks you’re freezing an empty plate if Mr. Delightful has first crack. And blondies. Long time since I’ve heard even the name. But they’ll do fine. Sweet chewy, that’s the trick. And you’ve mastered it. 5 cleavers. Sully, I'm so honored to be the recipient of the coveted 5 Cleavers award! Mr Delightful thought you might like this one! Rue, thank you. I hope you'll like them as well as your usual store brand. Store bought brownies can be very good, but I like to make mine all organic. And they do make the house smell all cozy while they're baking. Wow, I really can't miss them, hubby loves brownies so much, especially if they're chewy, thank you again and again, my lovely friend ! Dany, mine does too! Me -- I'm not so keen on chocolate. But next time I'll make a non-chocolate treat for me! Thank you, Cheryl! I do love my Earl Grey! Okay, Martha Ellen, I'm on my way. I smell the Earl Grey! They look great but bites? More than one would be so noticable. And when I make a 9x13 pan, I can cut little slivers. LOL. I like brownies chewy and with chopped pecans or walnuts. I always add more cocoa powder than called for and bake them at 350 F.for exactly 23 minutes. But I have such a weakness for them that I don't make them often. Actually, maybe those 'bites' would be more self regulating. Of course, I like chewy brownies with tea! Now I'm craving brownies. Hee! I am drinking a cup of tea right now and your brownie bites would go so well with. I'm pinning the recipe for later. Too funny, Judy! Yes, I'm all about "self regulating" -- sometimes we can trick ourselves, can't we? Margie, thank you. Go ahead, have a brownie! Thanks, Gerlinde. And if you pipe on a little rosette of frosting, they're cute enough to put on a three-tiered stand for afternoon tea! Going to have to try this one. I'm a chocolate addict. Thank you for sharing this post at the Wednesday AIM Link Party. I shared it on my social media sites. I cant wait to try these brownies, look at them - so yum and extremely inviting! I am so with you! Want a cakey brownie? bake cupcakes. I love the chewy, delicious, chocolatey treats!! This is certainly a unique way to make them -- no crumbs and all the same size. And if I snuck one or two -- there would be a cut as evidence. :-) Great idea! Grammy Dee, thanks. And thank you for sharing on your social media sites. Much appreciated! Menaka, thank you. And, like you, I make them with all organic ingredients. Exactly, Marisa! No evidence! :D And, "want a cakey brownie, bake cupcakes," -- so true! Have something like brownies on hand as a great snack, easy treat, chocolate fix is always the way to go. Thanks for linking up with Blogging Grandmothers. Thank you, Candace. I'm definitely going to keep a supply in the freezer! What a great idea to make them like this! yummy! Thanks, Amy! I like cute food! Yummy! Those are the cutest and I bet they are delicious. I know what you mean, Greg! Undercooked is not good. Brownies are my favorite and like you I am a chewy brownie fan. These look cute and adorable. They would be lovely with a coffee cream cheese icing dabbed on top. Thank you for sharing at the #HomeMattersParty. Thanks, Leanna! Sorry about the allergy. But don't worry. Food allergies change all the time. I was deathly allergic to some foods, avoided them for several years, and then the allergy went away and I became allergic to garlic. Mmmmm Jean, I love chewy brownies (and cookies, for that matter!). Wish I had one of your mini brownies with my cuppa tea right now. Thanks, Kitty. Mmm, yes, chewy cookies -- I'd like a chewy molasses ginger cookie right now! I am with you, Jean - brownies must be chewy and is not cakey! The only thing on which we don't see eye to eye is that I am a center brownie kind of guy. If you were edges, the better! Still, these brownie bites look perfect and perhaps the edges are better when they're round? I also want to report back that I made your Bakewell tart the other day and it was amazing! Thank you so much, David. I do love my Bakewell tart! 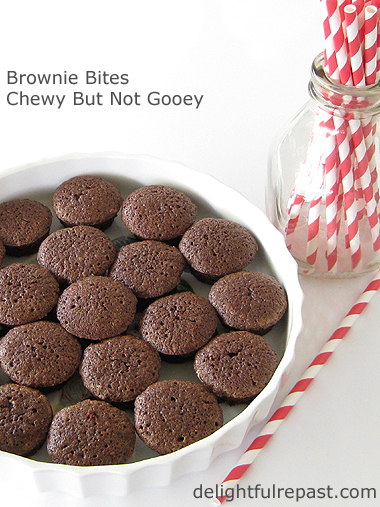 So much better than anything chocolate, even chewy brownies! I love everything that is bite seized, and honestly i kind of think anything that can be bite sized tastes better that way! can't wait to try these! Thank you, Brandi! And I hope you'll let me know how they turn out for you! wow...so many comments already. You hooked all of us with the picture of those lovely little brownies! Will be trying it out. Thank you, ARC! Let me know how you like 'em! These look delicious. I can't wait to these! Thank you for sharing with #blogginggrandmothers. I am pinning for future use. I think it is as you said to Debbie, "Sounds like you just like chocolate! :D" Yes I do but, Jean, these do sound and look especially good. Thank you for the recipe. I will save it for future days - when your gingerbread cake recipe is sadly gone. Lily, thank you. When you try them, let me know how they turned out for you! These look totally amazing Jean. Perfect for the PB and chocolate trifle! Thank you for sharing at #ThursdayFavoriteThings! Have a wonderful week. Thanks, Anon! PB and chocolate is one of those classic combinations. Those would satisfy the chocolate cravings! Thanks for sharing Jean! Thanks, Bernideen! I love joining your tea party! Thanks, Grammy. Social media shares are always soooo appreciated! It looks delicious! Brownie is something that everyone likes. Thanks for the recipe! Also, thank you for you visit! Thanks, Angela! Even I like brownies, and I don't even care for chocolate! These look delicious and just the right size. Thanks for the recipe Jean, I've pinned and tweeted. Thanks, Sue! I am fond of miniature desserts. Social media shares are soooo appreciated! 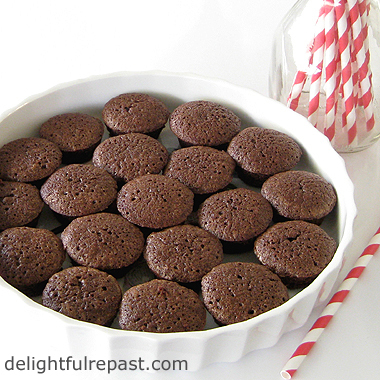 I always like mini bites of desserts and your brownies sound perfect. Karen, thank you! Mini desserts are always fun *and* make me feel somehow "healthier!" Menaka, thank you so much. And, of course, they are organic! Oh wow, Annette, that sounds like my kind of thing! Start the hot chocolate -- I'll be right over! Jean, I'm going to show myself up as a terrible philistine, but I don't think I ever met a brownie I didn't like... except I might be one of those rare people who enjoy the middle slices. So I don't think I mind cakey or chewy or gooey even. In my family, we use the word "chuggy", and if a brownie claims that description then that means it's a fine specimen. But now you mention it, blondies are pretty appealing, too. Jean, I love chewy brownies too. Your little bites are really cute and would accompany my coffee and tea perfectly. A cup of hot chocolate would be nice too. Only thing is, it would be almost impossible to have just one or two! I must try making these. My hubby loves chocolate but he's not supposed to eat a lot of it. A brownie bite or two wouldn't hurt him. Thanks for sharing another wonderful recipe. Thanks, Pauline. I like your family's word "chuggy!" I just might have to adopt it! Sandi, thank you. And tell your hubby to do what I do: put just two on a lovely little plate and eat them very slowly with the tiniest fork you have. I am definitely a chewy fan! Thanks, Grumpy Mum! Definitely get your baking stuff out of storage! I am just in time to enjoy your delicious Brownie Bites, just delicious! Hope you are having a great day and thanks so much for sharing you awesome post with us at Full Plate Thursday. Thank you, Miz Helen! I will. It's such fun! These look great, Jean. I might have to make these for book club. Or maybe a trial run before, just because! Thanks for coming over to the Gypsy and leaving such a nice comment! It's always fun when you visit! Jeanie, thank you. They'd be perfect for book club. Wish I could join you! I like these little bites, I have a great excuse to eat more than one or two. Who's counting! That's my problem, Nikki! If I don't put a certain number in a certain place, it's too easy to grab "just one" every single time I walk by! These would disappear in a heartbeat at my house! You are right, these are way cuter than a pan full of brownies! they sound wonderful, and would make a good base for a chocolate trifle, too! Thanks for sharing at Celebrate Your Story! I love these, easier to take to a gathering because they have fewer crumbs than brownies when you cut them. Thanks, LR! I think you're right -- and it seems I'm always hauling food somewhere! Thank you so much, Donna! You just made my day! I'm always surprised to hear people talk about the coveted brownie edge pieces. Everyone at my house wants the middles! Ruth, great to hear from you! I prefer the middles, simply because I like all the pieces on the serving tray to look exactly the same. So I trim the edges, then cut the brownies! The edges are my little "ccok's treat." If you all like middles, with these you would just make sure not to overbake. Hi Jean! Your food looks amazing. Your pictures on your site are great too! I might have to try a salad with brownie bites for dessert! Sarah, thank you! I'm so glad you like the photos, too.